1. Place the noodles in a large bowl, cover with a kettleful of boiling water and leave to soak for 15 minutes, stirring once or twice to make sure the noodles don’t stick together. 2. While the noodles are soaking, place the stock cubes, onion, ginger, chilli, cinnamon, star anise and 750ml boiling water in a large pan and bring back to the boil. Simmer for 10 minutes. 3. Meanwhile, cook the steak in a non-stick frying or griddle pan for 2–3 minutes on each side, until nicely browned but still a little pink in the centre. Transfer to a plate, let it rest for 5 minutes, then slice thinly. 4. Stir the beansprouts and pak choi into the broth and cook for 2 minutes or so until the vegetables are tender. 5. Drain the noodles and divide between 2 bowls. 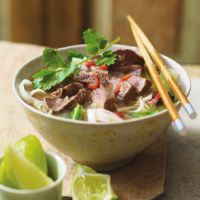 Ladle over the broth and vegetables then top with the sliced beef and coriander. Serve with lime wedges for squeezing over. The steak can be swapped for 150g raw king prawns. Stir into the soup 2 minutes before adding the beansprouts and pak choi and ensure they are cooked through before serving. This recipe was first published in September 2013.